Whew, it has been awhile. I’m here to give a quick overview of the Google Home Mini compared to the Amazon Echo Dot. After using the Amazon Echo Dot for the past 1+ years, the Google Home Mini (and other versions of the Google Home) win for a few reasons. The speaker and sound quality of the Google Home Mini are better than the Amazon Echo Dot. You could almost use it as an everyday speaker as long as you’re not throwing a party and you have relatively quiet surroundings. You can make phone calls through Google Home and the Google Home Mini using your Google Voice phone number. No phone required. One thing they need to fix is the ability to connect the Google Mini Home and other Google Home devices to Bluetooth headsets. If you don’t have a Google Voice number set in Google Assistant, the phone calls with show up as “No Caller ID” to the person receiving the call. You can dial by name from your Google Contacts, or by phone number. The Google Home Mini and Google Home devices are more likely to understand complex questions, and you can ask follow-up questions. So the Google Home is more contextually aware. The Google Home Mini and Google Home devices don’t require you to add skills to achieve things like requesting a rideshare, playing simple games, etc. The setup process for the Google Home devices is much more pleasant. It doesn’t require you to disconnect from your wifi and connect to the device. After putting more than 500 miles on my Northrock SC7 hybrid bike, I’m shopping for my first road bike. I’d like to keep the price under $1,500, and am aiming for a decent gruppo (or groupset), such as the Shimano 105. The search is overwhelming. There are so many different manufacturers, brands, models, frames, forks, prices, local bike shops, etc. At this point I’ve narrowed the choices down to the Raleigh Revenio 3.0, the Felt Z85, or the Giant Defy 1. Please share any thoughts or suggestions to help with the decision. UPDATE: I ended up looking at a Cannondale CAAD10 and I fell in love, though it was a bit out of my budget. I finally came across a local dealer with a 2010 Cannondale CAAD9 4 with SRAM Rival/Force gruppo. I’m very happy with the bike! Lightweight, solid bike with a comfortable, smooth ride. I am 6’3″ 200lbs and the Northrock SC7 fits me nicely. Seat height adjusts with ease using quick-release lever on seat post. The brakes work like a dream. Shimano Crank, Drivetrain and Tektro Brakes are some of the best components around. I wasn’t familiar with the Northrock brand, but the frame has a lifetime warranty. The Northrock SC7 was $259.99 at our local Costco, so the price is definitely a pro. A hybrid bike with similar components is several hundred more at local shops. Costco’s generous return policy is also a pro. on the Northrock SC7 are plastic and feel a bit cheap. The seat moves slightly from side to side when biking. The SRAM MRX twist shifters are listed as a feature, but I worry they won’t last as long as a convention shifting mechanism. Many experts say any bike purchased from a retail outlet should have a tune-up from a bike shop right away. This could could easily add $50-$75 to the cost of the bike. 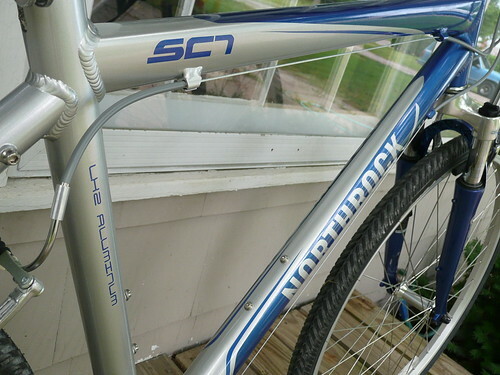 I’m no expert, but the Northrock SC7 rides and shifts smoothly, so I think I’ll skip the tune-up. Be sure to physically inspect the bike for damage from customer mishandling prior to purchase. A durable lock. The Abus U-Lock is my favorite. Choose from a large assortment of helmets. Rear and front light. A rear light is the law in many jurisdictions.